Ju 87B (B-1/B-2) - An important development was that of the automatic bombing or dive control system of the Ju 87B. This consisted of an Askania autopilot, which was used together with a Revi gunsight. The bomb release gear, elevator controls, and dive brakes were linked to this system. Before attacking the pilot would set the bomb release height and go thru a checklist of about 10 items. The deployment of the dive brakes automatically set up the dive adjusting the elevator trim tab, and putting the aircraft into a dive. The use of the elevator was forbidden (except in case of emergency) so the pilot used ailerons only when setting up the attack angle via red degree lines painted at various angles on the canopy. When the bomb release height was reached and the bombs were dropped and a light came on the contact altimeter. All the pilot had to do was push a button on the control column and the autopilot adjusted the elevator trim tab again, so that the aircraft became tail heavy and pulled itself out of the dive. The pilot thus needed not to be concerned too much with the pull-out. This was just as well, because the pull-out put an acceleration of 6g on aircraft and pilot. Under such conditions one could not expect the pilot to perform complicated control sequences. Normal procedures called for a bomb release at an altitude of about 2,953 ft (900 m), which brought the Stuka down to about 1,312 ft (400 m) before it started to regain altitude. 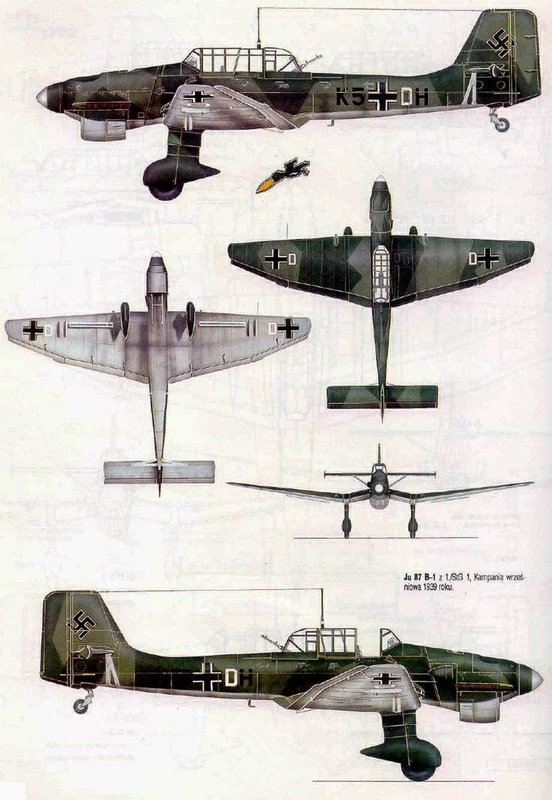 The Ju 87B was to be the standard model during the early years of World War II. It was powered by the much more powerful Jumo 211A engine. This engine had fuel injection, an important feature for an aircraft which had to be subjected to heavy G-forces and acrobatic maneuvers making it immune to icing and engine cut-outs. A new engine cowling was designed, with a new air intake on top of the cowling, and a deep half-circular radiator under it. The radiator was larger for the B-2 model than for the B-1, because the B- 2 had an even more powerful engine, and it can only be described as a deliberate insult to the aerodynamicists. The Ju 87B-1 was powered by 1,200 hp (895 kW) supercharged Jumo 211Da engine with a SC 500 1,102 lbs (500 kg) bombload. The Ju 87B-2 was an improved version with a 2,205 lbs (1000 kg) bombload. Some Ju 87B-2s flew as single seaters allowing the use of a single 2,205 lbs (1000 kg) centerline bomb. The trousered undercarriage of the A-model was replaced by a 'spatted' one, with closer-fitting leg covers and better streamlined wheel spats. The change was more than cosmetic, for the undercarriage was also redesigned and considerably strengthened. The mainwheels were also moved slightly backwards. If the Ju 87 had to operate from poor airfields, such as found at the Eastern front, the spats were often removed because they tended to get clogged with mud. It was not even uncommon for Ju 87s to have their undercarriage ripped off when operating from such airfields. Speed in a dive built up to about 342 mph (550 km/h) and it became common practice to fit sirens, called 'Trumpets of Jericho' on the undercarriage legs in a special fitting to enhance the effect on morale of the Ju 87's attacks. This was driven by a small propeller on the left undercarriage leg. When the siren was not installed the mount was faired over, leaving a protrusion on the undercarriage. The sirens were mostly discarded during the Battle of Britain, because they reduced the performance of the already slow and vulnerable Ju 87. The greenhouse canopy of the Ju 87B was also different of that of the Ju 87A, with sliding sections for the pilot and the gunner, which replaced the earlier hinged entry panels. The twin radio masts of the JU 87A were replaced by a single, tall, vertical mast. Italy used several examples of this aircraft under the name "Picchiatello" which led to the mistaken belief that it was made in Italy as the Breda 201. 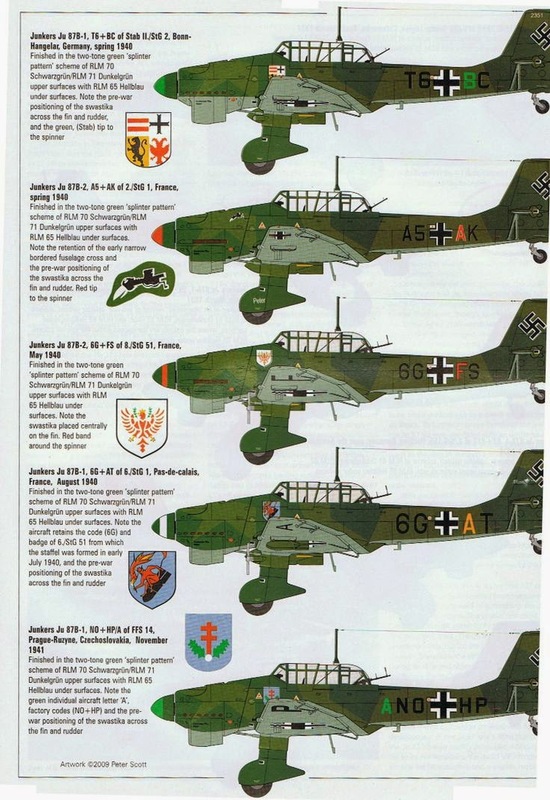 Three Ju 87B-1s made the first combat mission of World War II when they took off from Elbing at 4:26 am on 1 September 1939 and devastated the approaches to the Dirschau bridger over the Vistula at 4:34 am, some 11 minutes before Germany declared war on Poland. 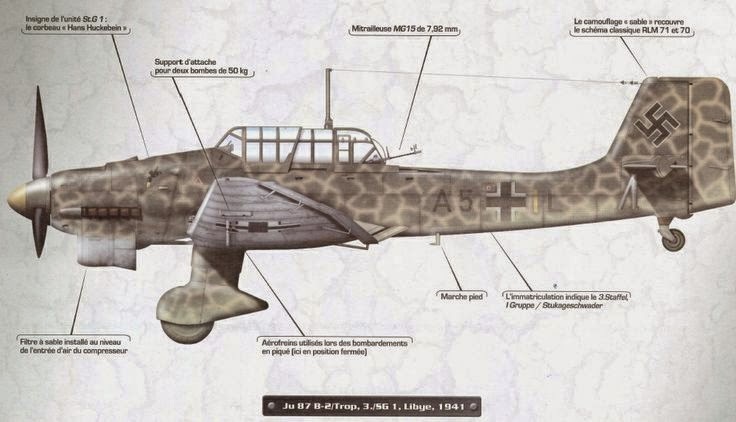 Subsequently, the Ju 87B-1 played a tremendous part in the Polish Campaign, destroying all but two of the Polish Navy surface warships, heavily bombing Polish troops (on many occasions within 330 ft/100 m of advancing German forces. On one ghastly occasion Ju 87B-1s virtually wiped out a Polish Infantry Division at the Piotrkow railway station. Ju 87R (R-1/R-2) - The Ju 87R was a long-range version of the Ju 87B, with design features of the Ju 87C. The out-of-sequence R-designation stood for `Reichweite', or range. They were intended for anti-ship attacks, and proved very effective during the fights in Scandinavia. An additional fuel transfer system was fitted, new fuel tanks installed in the wing, and the outer wing attachment points were modified so that 300 liter fuel tanks could be carried instead of bombs. A single centerline 551 lbs (250 kg) bomb was the normal ordnance. The R-1 and R-2 were equivalent to the B-1 and B-2, but the R-1 had a longer range, because the B-2 model was heavier than the B-1. One Ju 87R aircraft was tested carrying a large container hung on the main bomb crutch, intending to carry spare parts and other cargo. Two 7.92mm MG 17 machine guns in wings. One 7.92mm MG 17 machine gun in rear cockpit. One 1,100 lb. (500 kg) bomb on centerline.